Ginger root health benefits have been widely utilised through India, Asia and Africa for thousands of years. Both Ayurvedic and Chinese traditional medicines make extensive use of the diverse health benefits of ginger, including as an aid to the digestive system. Ginger increases the activity of lipase and other digestive enzymes. Gingerols, which are the source of ginger’s hot and spicy flavour, stimulate bile flow and are also responsible for ginger’s anti-inflammatory, anti-nausea and antioxidant properties. Ginger contains a protein-digesting enzyme called zingibain and can be used to treat colic and dyspepsia. One of the essential oils in ginger, zingiberene, works in conjunction with gingerols to protect the lining of the stomach. The aromatic oils in ginger are useful for aiding digestion and reducing flatulence. Ginger’s secondary digestive support role is played by extending the shelf-life of meat. Marinating meat in ginger has been shown to kill a range of flukes, nematodes, worms and other parasites. Heating and drying processes partially reduce the level of gingerols in ginger. It’s essential oils are also better retained when fresh. 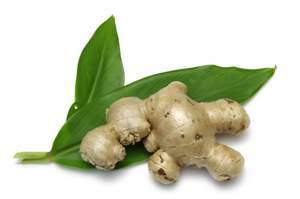 Add fresh ginger to your food after cooking as cooking processes destroy enzymes and aromatic oils. Click here for instructions on how to make ginger tea.